From a single bottle filler, to a whole packaging line, or an entire process automation and control project, count on RCS Electrical Services to bring your project to a successful conclusion. In our staff we have electrical engineers, controls technicians, and industrial electricians. Our team is well qualified to successfully handle your project. Electrical Engineer Available To Design Food And Beverages Packaging Machines Controls. If you are an OEM who needs help designing the control systems for a food or beverages packaging equipment, let us know about it, we can help. Or maybe you are end user who is upgrading and retrofitting an existing machine. 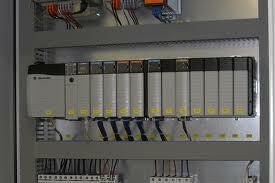 Our electrical engineers can draw all your existing control systems and associated control wiring. When you have any kind of project involving integrating, retrofitting, or designing controls for any kind of machines for packaging beverages or food, contact us. All you have to do, is give us your machine sequence of operation, and we will go to work to make it happen. Click here to request an automation consultation. Cosmetic and fragrance packaging machine controls and wiring is another area in which our company could collaborate with yours. We are proficient on the selection, specification, and use of common industrial electronic components such as motor starters, contactors, relays, proximity switches, photo-electric switches, temperature sensors, position sensors, temperature sensors, PLC's, controllers, digital and analog signal handling, AC, and DC motors and their controllers. We are also able to install, service, and maintain machines electrical systems to manufacturer specification. Let us know if you need our assistance in any of these areas. Pharmaceutical and biomedical packaging machines need special care. Whether you are a manufacturer or an end user of these machines, we are able to help. We can help designing and specifying the electrical control systems for your machines. If you have machines that need to be retrofitted or upgraded, we can do this for you also. Contact us for all your pharmaceutical or biomedical packaging machine controls needs. If your team is repowering a power plant control system, let us know about your personnel needs. Whether you are specifying new components, new software, or building new control panels, we have the personnel that can support your efforts. Let us know about your controls needs when is time to do upgrades on power plants. We can custom build control panels, program PLC's and control modules, and do typical calibrations needed when analog systems need to interface with digital control components. We have electrical engineers available for this area as well. If you are upgrading the control system in a water filtration plant, let us know if you need assistance. We have lots of experience with water treatment plants instruments and sensors. We are capable of helping either in the design and specification stages, or later during the wiring process. You may be dealing with a project that calls for VFD's, motor control centers, or just individual motor controls. We have experience in terms of motor specification, installation, repair, or troubleshooting. If you have a project that is giving you difficulties in terms of the electric motors, contact us. We have expertise in the area of controls panel specification, construction and wiring. If your project calls for one control panel or several dozens, we can help. Contact us regarding your needs for control panels.